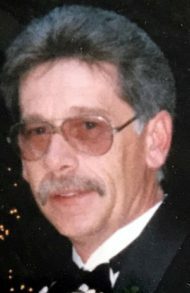 Vernon D. Martin, 67, of East Hempfield Twp., passed away at Hospice & Community Care, Mount Joy on Monday, April 8, 2019. He was born in Lancaster to the late Paul B. and Arlene (Denlinger) Martin. Vern was the loving husband of Tamara “Tammy” L. (Banzhof) Martin for 44 years. A 1969 graduate of Pequea Valley High School, Vern drove truck for Air Products from 1981 to 2007. He then owned and operated Papa Dino’s on Lincoln Highway East from 2005 to 2018. He was a former member of Hershey Mennonite Church and more recently attended First Presbyterian Church in Lancaster. Vern loved spending time in his pool and with his family. He had a dry sense of humor and was always joking. He was a hard worker and great provider, always putting his family first. In addition to his wife Tammy, Vern is survived by their daughter Nichole Hawk, fiancé of Kevin Hess of Manheim and son Jeffrey Martin, partner of Jennifer McCormick of Lancaster; his grandchildren Madison and Gavin Hawk; and his brother Glenn P. Martin, husband of Deb of Kinzers and his sister Linda, wife of the late James Nolt of Manheim. Vern’s family will greet friends 10-11 AM, followed by the funeral at 11 AM with Rev. Mark J. Thiboldeaux officiating, on Friday, April 12th at the Charles F. Snyder Jr. Funeral Home & Crematory, 3110 Lititz Pike, Lititz, PA 17543. Interment in Manheim Fairview Cemetery. Please omit flowers. Memorial contributions may be made to Hospice & Community Care, P. O. Box 4125, Lancaster, PA 17604-4125. I want to give my Condolences to Tammy and the Family you all have my Deepest Sympathy, Vernon was such a nice person when ever I would see him at Capps or Papa Dino, or at Stauffer, He made the best Vegetables Soup, he will be miss. I am sorry to heard about Vernon’s/ your dad’s passing. I have always treasured the love and support you all gave me. I have never forgotten any of you and think of you often. Again my deepest thoughts and prayers are with you all. My condolences I worked with Vern at Airproducts always enjoyed talking to him.